Horoscope of Albert Einstein – Importance of Neech Bhang Raaj Yoga. Mercury receiving a Neech Bhang Raaj Yoga. Moon receiving a Neech Bhang Raaj Yoga. General Overview of Chart – As per the data available online, Albert Einstein was born on 14th March, 1879 at 11.30 AM at Ulm, Germany. As we can see that he was born as Gemini Ascendant with Ketu in 2nd house/Cancer, Moon in 6th house/Scorpio, Mars-Rahu in 8th house/Capricorn, Jupiter in 9th house/Aquarius and then a stellium of Sun-Mercury-Venus-Saturn in 10th house/Pisces. Neech Bhang Raaj Yoga – Now, the concept of Neech Bhang Raaj Yoga (http://astrosaxena.com/neechraj). This yoga takes place when a planet is debilitated in chart but it is receiving strong support from any other planet which is strongly placed in chart. Then they say that debilitation of planet gets cancelled due to impact of strongly placed planet on that debilitated planet. There are many ways a Neech Bhang Raaj Yoga can take place but the strongest of such yoga happens when the planet which is debilitated is sitting with an exalted planet or its lord is exalted plus if it is in Kendra or Trikon Houses. Then the Neech Bhang Raaj Yoga really manifests during its dashas. An argument can also be made that when a weak planet is receiving a support from a strong planet then why not a strong planet is feeling weakened when it is conjunct a weak or debilitated planet. Here we need to understand that planets represent consciousness and consciousness is supposed to travel upwards. The best example to relate consciousness is Fire. Just like Fire always moves or travels upwards, the consciousness is also supposed to move upwards. So to simply understand, a planet with weak dignity will start behaving well if it is getting some support from a strong planet but planet in strong dignity will still be strong enough and will give some good results regardless of impact of any negative planet. Like, if someone has Sun exalted in Aries but Aries lord Mars is debilitated, he will still assert some qualities of leader relevant to exalted Sun. Mars debilitation can make Sun weak but it won’t take away everything which an exalted Sun has. Best example is Jim Jones Chart (http://astrosaxena.com/jonestown) who had this Sun-Mars combination but he was still regarded as leader by people. The event of Jonestown was result of many factors like his birth Moon, dasha and transits coming together. We can’t blame it solely on his debilitated Mars though it remains one of factor but not the only factor. Mercury Debilitated – Now, back to Albert Einstein. He had Mercury debilitated in Pisces. Mercury represents intellect and when it is debilitated, his intellect should be weak. So, the question posed is correct. But maybe this is also the reason that time and again I have said that I least care about Mercury’s debilitation. It is because Pisces is the sign of imagination and Mercury is, as we know, person’s intellect. So, when Mercury is in Pisces, person’s intellect roams around in imaginative world. That’s why, a Mercury debilitated person can have very strong imagination and intuition ability. This also makes them very good authors as Mercury represents communications. So, they can reduce their imaginations into writing. Interesting to note that many best-selling authors are born with Mercury debilitated. The place where Mercury debilitation can hurt someone is in his relation with siblings, skin/speech/nervous system disorders. Also, when Mercury is debilitated, either person is unable to explain his point of view to others or others are unable to understand him which is obvious because intellect is totally in imaginative world here. Mercury receiving a Neech Bhang Raaj Yoga – But the most important thing in his favour was that Mercury was receiving a Neech Bhang Raaj Yoga as Venus was also placed in same house/sign. As Venus is exalted in Pisces, it cancelled the debilitation of Mercury and this was the reason why he became a super-intellectual person. Another reason was that this yoga took place in 10th house of chart which is 2nd most important house after 1st house. As 10th house relates to fame, public image and Govt, his work (10th house) provided him everything. Last but not the least, as we discussed recently the conjunction of 4 or more planets in a house/sign and I said that if Saturn is part of any such conjunction then results will be delayed and will come only after hard work. He had Saturn in 10th house/Pisces with Sun-Mercury-Venus. Despite being such a genius intellect, he started gaining fame and recognition in his 30s and at the age of 42, he was given Noble Prize. Moon Debilitated – Then he also had Moon debilitated in Scorpio which indicates about tough life of his Mother plus his own research oriented mind. Moon is getting aspect of Ketu which further promotes research work and makes him deal with unknown and undiscovered stuff. Needless to say that he spent lots of time in understanding Astrology too. Moon receiving a Neech Bhang Raaj Yoga – Then Moon also receives a Neech Bhang Raaj Yoga as Scorpio lord Mars is exalted in 8th house/Capricorn with Rahu. Although, Mars is in a Dushthana House but it is still exalted. Rahu is exploding that exalted nature of Mars by being conjunct with Mars and 8th house is house of research. So, his whole effort and energy was directed towards research and hidden matters. This gave immense strength or I would say a right direction to his research oriented mind (Moon). So, these are two reasons why I feel that despite having Moon (Mind) and Mercury (Intellect) debilitated or at weakest point, Albert Einstein came out in life as Genius Intellectual Person. 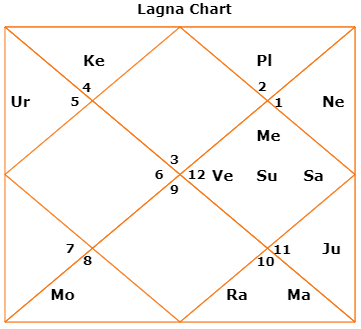 Another similar chart is of Sachin Tendulkar (http://astrosaxena.com/stendulkar) who has Mercury & Jupiter debilitated but both planets received Neech Bhang Raaj Yogas due to exalted Mars. Rule of Exception – But as always, nothing gets cancelled completely. A debilitated planet will also show some of its results sooner or later in life. As he had Mercury debilitated with Venus, it resulted in his divorce from 1st wife and marriage with 2nd wife. So again, Jeeva Karakas came to suffer and Ajeeva Karakas were benefited. Sir,can you post horoscope of jaggi Vasudev Sadhguru, please google it and kindly post is planets energy of article... because he is a great Guru (mystic)..